13 posts categorized "XRIJF 2018"
Every year, I make a “grand plan” for JazzRochester's coverage of the Xerox Rochester International Jazz Festival. Most years, the amount of time I have to implement these plans falls short of my grand plan. While this summer at least I’m in town for it (see 2016), and I plan on the usual crazy nine days of music, liquid refreshment, street food, etc., the combination of being a new homeowner (and learning what that means… just had the AC go out) and an unanticipated uptick on the attention I’ll have to give my day job during the festival are conspiring to undermine my plans even more. So much for my “grand plan”…. In some ways, my worries of not meeting expectations are really just a reflection of the knowledge of what I wanted to do compared to the reality of what I can do with the time I have given my “real” life. Over the 10+ years that I’ve been doing JazzRochester, and covering the jazz festival in these pages, the success of the festival has changed my relationship with it. When I started this blog, there was not very much coverage of the Rochester jazz festival in the major media in Rochester and the traffic to JazzRochester would triple or better during the festival. Now, the media market is saturated with coverage and my little old JazzRochester blog is just another voice among the many news and other outlets that have much louder "voices." My traffic actually goes down during XRIJF! While I would hope to gain new readers, the reduction in traffic is fine with me; it shows the success of the festival, and I hope that success may translate into an expanded audience for live jazz in and around during the other 356 days of the year (in fact, that has become my catch phrase as you see by the image accompanying this post). And this blog is mostly about the 356 days of the year. Increasingly over the past years I have been focused on getting out and hearing the music during the festival, and … frankly… enjoying myself. The lineup this year has the usual mix of those who I know and those I don’t. There are no artists this year who are on my “bucket list.” That’s not a bad thing…. As I’ve said before, it just makes it likely that my “picks” morph during the festival and that I’ll create opportunities to discover new sounds and artists in real time. As John Nugent has said over and over, “it’s not who you know, it’s who you don’t know” that matters. I plan on hearing as much of the latter as possible, so my “itinerary” will be in flux … on purpose. I’ll try to let you know the ones I think are “must sees” each night, so check out the blog and other channels for that. I will use the other JazzRochester platforms, especially Twitter (currently at over 11.7K followers), the JazzRochester Facebook Page and JazzRochester on Instagram, to connect festival goers with the artists as they communicate about the festival and their music and images from the XRIJF. . In addition, I have a list of the Twitter handles of artists at XRIJF that I’ll be checking out (and you can too, if you’re too inclined). I’ll also use Twitter and Facebook to share the information about the festival being put out by XRIJF and other ROC coverage of the festival. Follow me if you’re on those platforms. I will try to do a recap post each day of what I ended up hearing the night before and a preview of the music I hope to hear that evening. I’ll try to get these out to subscribers in real time on the blog, so check your email before heading down to the festival. But don’t be too surprised if my aforementioned life gets in the way. I will continue to do the Wednesday listings post to let you know about other live jazz in and around Rochester. I hope that you will let people know about JazzRochester during the festival, so more people who are discovering the wonderful music at XRIJF and especially that played by the many local artists and bands and musicians who will be participating this year, are also hip to where to find the most complete listings for live jazz during the rest of the year. Tell your friends; tell people you’re standing next to in line! See what I mean? To learn more about some of these musicians and bands, see if you can access their websites on JazzRochester's Rochester Jazz Artists & Groups page, which is also available from a link at the top of the site above the banner. Remember that some of them (and the rest) will be playing outside of the XRIJF. Check out my Wednesday posts on June 20th and 27th for listings during the festival. Got a smartphone? Get XRIJF 2018 on it! The Xerox Rochester International Jazz Festival app for iPhone and Android smartphoneswas made available for download at the end of April. With the 17th Edition starting in in less than eight weeks from June 22 to June 30, the app is a great way to set up your schedule for the festival, which features 1,500 artists from around the world performing in 300-plus shows and events at 20 venues. The free app allows festival-goers to experience the festival anytime, anywhere. The schedule in the app includes all of the music, including the great high school bands and free shows at the library by local artists. It's a great resource for us XRIJF fanatics. Artist bios, audio excerpts, links to artist web sites and more. Share your favorites with friends by connecting the app to your Facebook account. You can also send your schedule of favorites to your email to copy into the spreadsheets I know a lot of you use as a matrix to figure out how much you can squeeze into your 9 days (or less if you're less of a fanatic than I am....). Multimedia section will feature videos posted during the festival. Easily find venues with Google map links. Browse by artist, day or venue. Convenient search function allows you to search for concerts and artists. Buy tickets and Club Passes. Get info on getting around the fest, parking, shuttle service, food, street closings, FAQs, travel, sponsor activities and more. Connect to our latest social media latest posts including Facebook, Twitter and Instagram, all in one place. The 2018 XRIJF app may be downloaded free of charge for either device here or in through the Apple Store or Google Play Store by searching on "Rochester International Jazz Festival." See you on Jazz Street! Yesterday, I went to the press conference for the announcement of the lineup for the 2018 Xerox Rochester International Jazz Festival. Others in the mainstream media have covered the announcement well, including live streams by several. As I'm not a newspaper or other news outlet, I don't feel a particular need to announce it here on that day (I did on Twitter and Facebook). Our work on the festival starts after the announcement. Look for more here soon as I parse through the lineup. My initial thoughts are that there are a lot of opportunities to see some great jazz from artists I know and a host of other interesting artists who I don't. That's what I hope for ... that's what XRIJF usually delivers. For now, here's the poster and the artist lineup by date. Unfortunately, those venues and artists featuring blues and other genres of music who used to send gig info to WGMC have not provided the same to me. For now, I have removed the separate listings that Jazz 90.1 used to include on their Club Calendar. I can add it back, but need help. So back to your regularly scheduled listings... 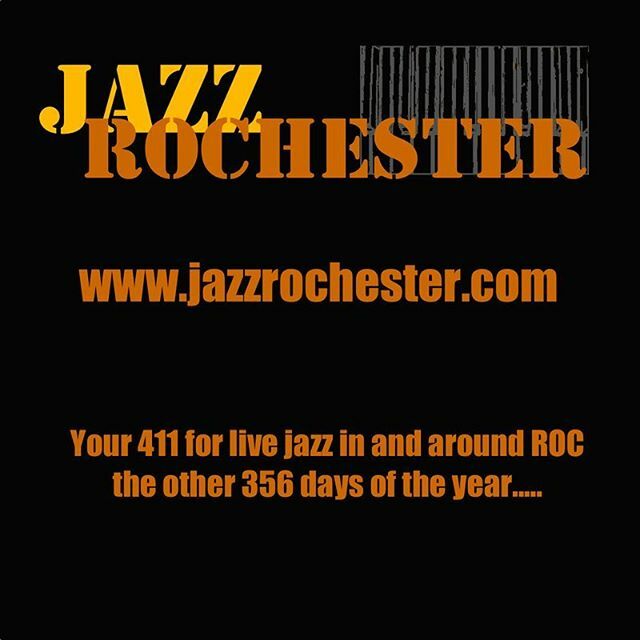 I collect as much of the live jazz in and around Rochester as I can find so you don't have to do it yourself ... right here, every Wednesday in JazzRochester. I really need your help to grow a more vibrant community for live jazz here in Rochester by sharing this post or this site with those you know who love live jazz. Share with the buttons! Follow us on Twitter, Facebook or Instagram! Sign up to receive our posts via email (there's a link at the top of the site). 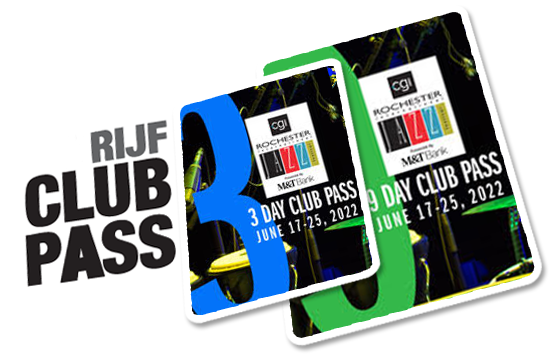 The Xerox Rochester International Jazz Festival announced on Tuesday that the Club Pass for the 2018 XRIJF, June 22nd-30th will go on sale at 10:00 am on Friday morning. The Club Pass can give festival-goers significant savings over purchasing individual show tickets and an opportunity to access up to 225 Club Pass shows at 12 different venues during the XRIJF. Personal 3 and 9-day passes. For single person use only, cannot be shared. Your photo (but no name) will be printed on the pass. This will be same price as it has been for past six XRIJFs, running from $174 to $204 for the 9-day pass and from $144 to $184 for the 3-day pass, depending on when you buy it, plus the $6 service charge. Shareable 3 and 9-day passes. These can be shared or transferred. No photos or names will appear on the shareable passes. These will set you back from $204 to $244 for the 9-day pass and from $174 to $194 for the 3-day pass, depending on when you buy it, plus the $6 service charge. In other XRIJF news, there are some venue changes coming in 2018. New this year will be the newly renovated Temple Building, a 1200-person capacity hall with 25 shows over eight days, June 22, 23, 25-30. I knew that one was coming, but it sure looks like it will be a great venue. The Lyric Theatre venue will not be returning as a venue next year and the Little Theatre will take a one-year hiatus from XRIJF due to renovations.